Nowadays many mobile phone users are facing data loss problems due to various reasons like accidentally press “delete button” on the phone, lost file during the file transfer from mobile phone to PC, mistakenly formatted memory card equipped within cell phone. If you have lost your all favorite songs, videos, pictures and photos from cell phone, with the help of mobile phone data recovery software you can recover all lost songs, photos, pictures, wallpapers and other precious data from your cell phone. Mobile phone data recovery software is comprehensive recovery solution which can help you recover deleted data from various kinds of cell phones. 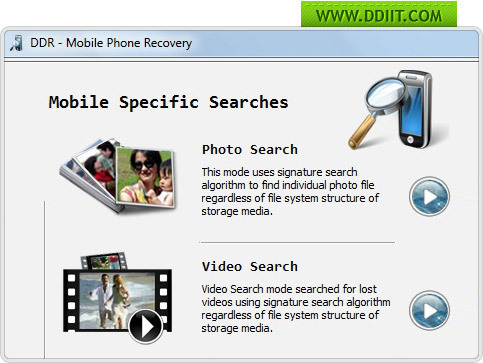 This cell phone recovery software uses inbuilt disk scanning mechanism to scan and rescue lost data. Install and run the mobile phone recovery software on your computer. After installed the program double click the icon to lunch the software. Connect your cell phone device with computer. Select the drive from which you want to salvage lost data. After that scanning process will be started for lost files. Saved recovered files and folders. After data loss happened it is restricted the mobile phone should not be used to store any new data because the old data might be overwritten by the new data. Once they are overwritten it is impossible to recover them. After recovering finished, don't store the recovery data in the path where you lost them before otherwise you will lose them forever.